Serving You For The Last 27 Years. Girard Interiors: Custom Blinds, Shades, Shutters & More! Girard Interiors is your solution for custom window blinds, shades, shutters, home organization, wall-coverings, reupholstery and upholstery repair service. We take great pride in our craftsmanship and attention to detail. Our specialists pride themselves on providing the excellent quality and value our customers expect and deserve. One way we do so is to provide personalized services. For instance, our free in-home design consultation is a great perk of choosing your new window treatments from us. Our experienced professionals can meet you in the comfort of your home to help you choose new shutters, window shades, blinds, solar screens or other window treatment products. Our professionals can also help you reupholster your old sofa or favorite armchair, install new carpeting, or choose a great wall covering to enhance your home's interior design. As your local New Jersey Hunter Douglas and Graber dealer, Girard Interiors brings you the most innovative and advanced window treatments available on the market. Because of our relationship with Hunter Douglas, Graber, and Lafayette, you have access to premium window treatment products at the best prices. Our custom shutters are extremely well made and come with the advanced motorization features you are looking for. We offer a full line of plantation shutters in real hardwood shutters and the durable Polycore shutters. They are custom made by the well-known American manufacturer, Hunter Douglas. 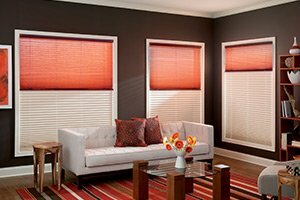 If you are looking for wood blinds, faux wood blinds, vinyl blinds, mini blinds, or aluminum blinds, you can find them at Girard Interiors. Whether you seek the rich, traditional elegance of natural wide-slat hardwood blinds, the sleek style of aluminum blinds, or the easy-care vinyl blinds, we offer them. Our premium fabric window shades offer a beautiful, highly functional design for your New Jersey home. Each shade is custom measured and crafted to fit your windows. We offer a full line of window shades including designer fabric, pleated, Roman, woven wood, honeycomb, and cellular shades. Girard Interiors is committed to catering to the needs of our local New Jersey clients. We have served thousands of happy customers over the last 27 years, and look forward to serving the community for many more with our quality reupholstery and custom window treatment products. Our shutter company provides the type of personalized service that makes it easy to give your home a complete makeover. Our professional designer is always available to schedule a consultation at our Westwood home interiors shop or can help you to compare fabrics, shutter styles, and other window treatments in the setting of your own home. I couldn't say enough great things about Girard Interiors! The owner, Wendy, was wonderful to work with. She was so knowledgeable, really listened to what I was looking for, and had amazing and creative ideas for my house. The finished products that were delivered and installed (by a phenomenal installer I might add) were more than I could have dreamed of. Thank you Girard Interiors for helping to make my house a home! What a wonderful experience working with Girard's Interiors. I had the pleasure of working with the owner, Wendy Girard. She was extremely pleasant and listened to my needs. I was looking to reupholster 2 chairs and possibly purchase a new sofa due to dog damage. I showed her pictures of the damage. She immediately knew my style and worked with me to find just the right fabric for the chairs. When she looked at the damage to the sofa, she suggested we add a leather look and just repair the panel and add some nail-head trim. I was very hesitant but put my trust in her as it is crystal clear she is a professional and knows her business. Not only did she save me hundreds of dollars by not having to purchase a new sofa, it looks like I have a custom sofa which everyone loves! Thank you Wendy, my living room looks great! Great ideas and willing to work with clients to best meet their needs. Have done two major renovations and couldn't be happier with the results. This is my fourth home that I've decorated with Girard's and all have turned out beautiful. Great service and quality. SO happy.